One way to make your Sunday morning easier is to make breakfast ahead of time. 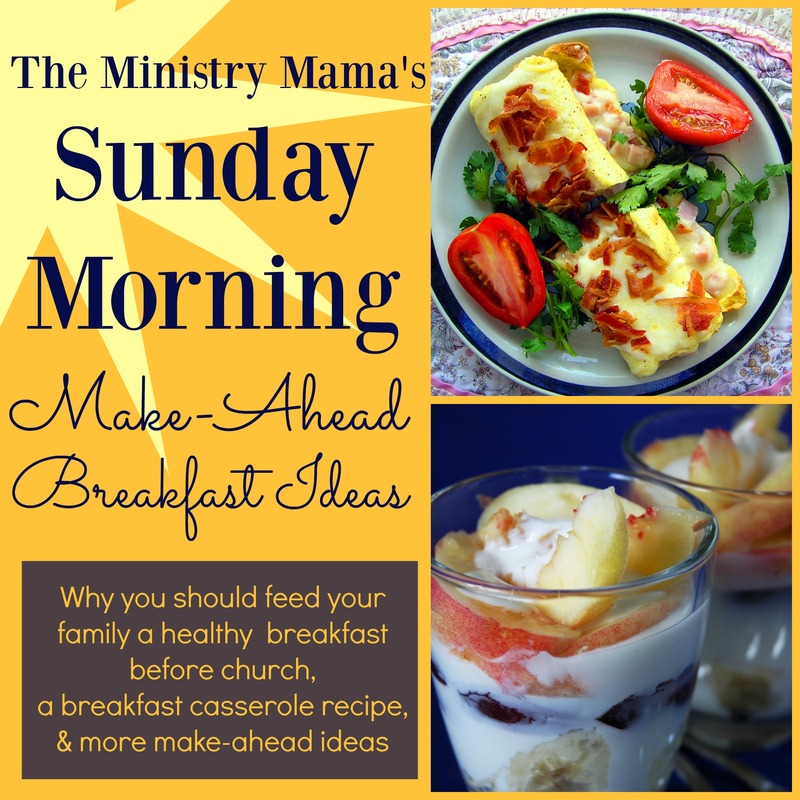 Invest some time on Saturday or earlier in the week into preparing your family a healthy or more filling breakfast for Sunday. You can choose to make a breakfast casserole and pop it into the oven when you wake up, fix something up in the Crock-pot overnight, or have some hearty foods frozen in your freezer. You will make for a happier husband, kids, and self if you’re filling up your tank on a day that we all know requires more energy than any other day of the week. Numerous ministry families rob themselves of the proper nutrients their bodies need and run on empty stomachs to face a busy schedule of service because they do not take time to eat on Sunday morning. You can help your family prepare for the ministry race by planning and preparing before the race begins. Just as you would plan for a Sunday afternoon meal, make breakfast a priority too! I used to hand my children cups of cereal Sunday mornings and feel so guilty for the extra sugar they were having but it wasn’t just sugar, they were going without protein. After church ended I would be frustrated because they were begging to eat candy before we could get into our van and get home for lunch. (Okay, that’s kids but you get my drift…) They were starving because our breakfasts were only carbohydrates. They burned those sugars when they were excited to see their friends and singing at the top of their lungs in Junior Church! Experience has taught me if our kids have a heartier breakfast they do better at listening in their Sunday School classes and being a blessing to those around them. Now, imagine how your husband serves without any energy to go on: doing busy tasks, dealing with unexpected situations, even diving deep into counseling situations. Sundays for a pastor have been said to be as hard on a man as a full-time work week with the burdens they carry on top of the physical job of preaching, teaching, and ministering. 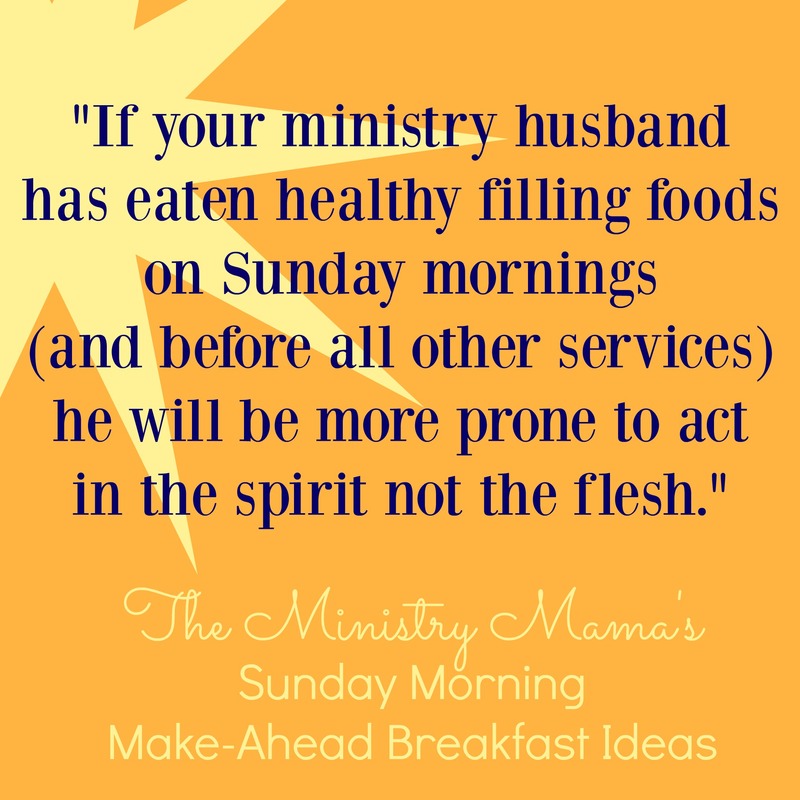 If your husband has eaten healthy filling foods on Sunday mornings (and before all other services) he will be more prone to act in the spirit not the flesh. We all know hungry men can be bears. A good breakfast can curb the bear and make him bear-able to be around. Note: There are husbands do not like to eat before preaching and I understand it helps with nerves or is similar to fasting, but be sure to have good foods available if and when he would want it. Ashley, a friend of mine has a breakfast casserole that she makes ahead on Saturday. On Sunday morning while they are getting ready she pops it back in the oven and lets it brown on top and warm up so her family gets a full stomach before they arrive to church. She shared her recipe with us. Spray the inside of your baking pan (glass or metal) with oil. Add hash browns to your pan, then add your meat mixture on top. Beat your eggs in a separate bowl, then mix in green chilies. Pour eggs into the pan. You might need to shift your pan back and forth to have the eggs settle between the hash browns. Sprinkle your cheese on top. Bake at 400 about 45 minutes until the eggs are cooked and browned on the edges. Remove it from the oven when it is set and browned on the edges. Then, let it cool, cover and refrigerate until Sunday morning. Reheat in the oven while you’re getting ready for about 15-20 minutes at 350. Serve with salsa and warm tortillas for a Southwest flavor or fruit and toast for a filling Sunday morning meal! Sausage Balls – 6 ways! Ministry Mamas, give us your ideas! If you have any breakfast favorites for your busy Sunday morning that are hearty and healthy and even in the “make-ahead” category then please share them with us in the comments.